We recently had a conversation with a fellow market vendor who didn’t like fall. Who doesn’t like fall? It’s one of our favorite seasons. You get to enjoy the final produce of the summer season. It’s finally time to harvest the fall pumpkins and gourds. The first frost. The tastes of pumpkin pie and apple cider. Fall festivals in every locale. Changing colors. Cooler days. The time for hearty meals in preparation for the upcoming winter. Who wouldn’t enjoy fall? Speaking of fellow market vendors, we finally got to meet our off Saturday market partner at the Zionsville market, Amy Pictor of Clearview Farm in Westfield. She also happens to be Amy Jeffries formerly of Union City. Who would have guessed? The taste of pumpkin. Betsy will again be featuring Paleo pumpkin treats this week. Hearty meals. We still have plenty of pasture-raised chicken available and will have pasture-raised pork in two weeks. Fall festivals. We will be hosting a heritage music festival in conjunction with the Lebanon Community Arts Council. 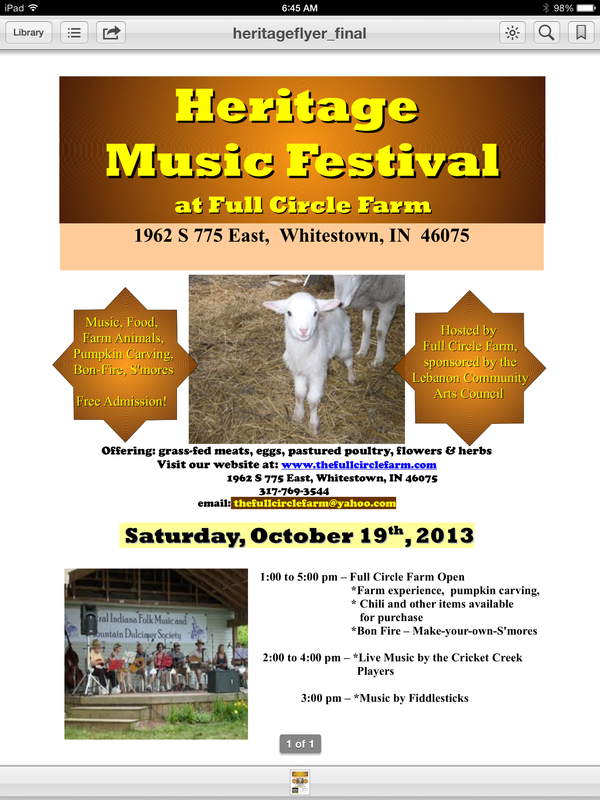 The festival will feature the Cricket Creek Players and will begin at 1:00 p.m. on Saturday, October 19. In addition to pumpkin treats, Betsy’s Kitchen will be offering Paleo sandwich bread and Paleo Spicy Chocolate Brownies. We also sell all of our products at the farm.